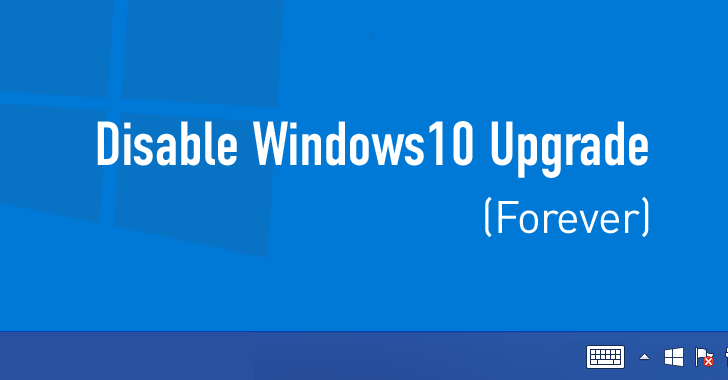 If you are a Windows 7 or Windows 8.1 user, who don't want to upgrade to Windows 10 now or anytime soon, you might be sick of Microsoft constantly pestering you to upgrade your OS. With its goal to deploy Windows 10 on over 1 Billion devices worldwide, Microsoft is becoming more aggressive to convince Windows 7 and 8.1 users to upgrade to its newest operating system, and it is getting harder for users to prevent the OS being installed. But if you're worried that this out of control Windows 10 upgrade process will force you into downloading an unwanted OS; I have an easier solution to block Windows 10 upgrade on your PCs. 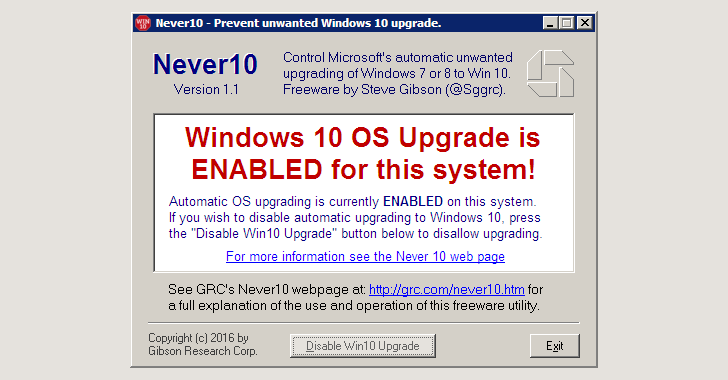 A new free tool, dubbed Never10, provides the user a one-click solution to disable Windows 10 upgrade until the user explicitly gives permission to install Windows 10. Never10 has been developed by Steve Gibson, the well-known software developer and founder of Gibson Research, which is why the tool is also known as "Gibson's Never10." Go to Gibson's Never10 official site and click on the Download. Once downloaded, the program detects if the upgrade to Windows 10 is enabled or disabled on your system and then shows a pop-up. If enabled, Click 'Disable Win10 Upgrade' button. You’ll again see a pop-up that now shows Windows 10 upgrade is disabled on your system, with two buttons to 'Enable Win10 Upgrade' and 'Exit.' Click on Exit button. That's it, and you have successfully disabled Windows 10 Upgrade on your PC. The best part of this tool is that you don't have to install an application on your PC to do this. Gibson’s Never 10 is an executable. So you just need to run it, and it doesn’t install anything on your computer. You can delete it when you're done. "The elegance of this 'Never 10' utility is that it does not install ANY software of its own. It simply and quickly performs the required system editing for its user," Gibson writes on his page about the new utility. According to Gibson, Never10 will be a great help to inexperienced users while advanced users will likely appreciate the fact that no additional software is installed and will be able to refer their family and friends to this easy-to-use utility. For more technical details on how this tool works, you can head on to this link. Unlike other available Windows 10 blocker tools, Never10 blocks the Windows 10 upgrade, but at the same time, the tool allows you to start the update process in case you change your mind, according to Windows watcher Paul Thurrott. "Many users of Windows 7 and 8.1 are happy with their current version of Windows and have no wish to upgrade to Windows 10." "There are many reasons for this, but among them is the fact that Windows 10 has become quite controversial due to Microsoft's evolution of their Windows OS platform into a service which, among other things, aggressively monitors and reports on its users' activities." Moreover, just a month ago, Microsoft was caught displaying unsolicited advertisements on its Windows 10 users' desktops. These reasons are enough for many users to stay on their previous versions of the Windows operating system.